My daughter wanted me to go with her but uh, no, it’s not for me. All of her friends are coupled evidently. 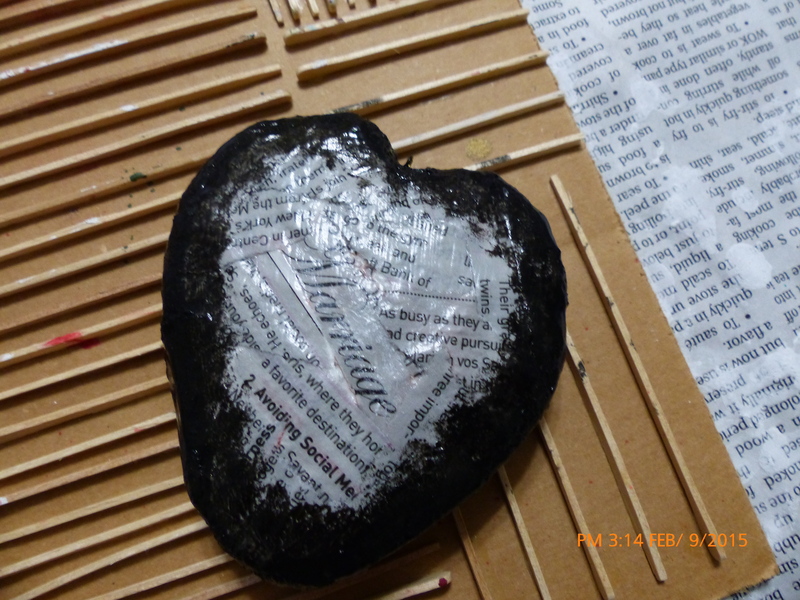 Regardless, I have been thinking about the Abandoned Art Project and since I don’t have time to do anything for Valentine’s Day, I decided to make Alexx a black heart ornament. First I traced around each crocheted heart for a template. Then I cut out a corrugated cardboard heart and then cut out a duplicate. I made a pencil mark on the insides so I wouldn’t reverse one side. I did not worry about symmetry or perfection. 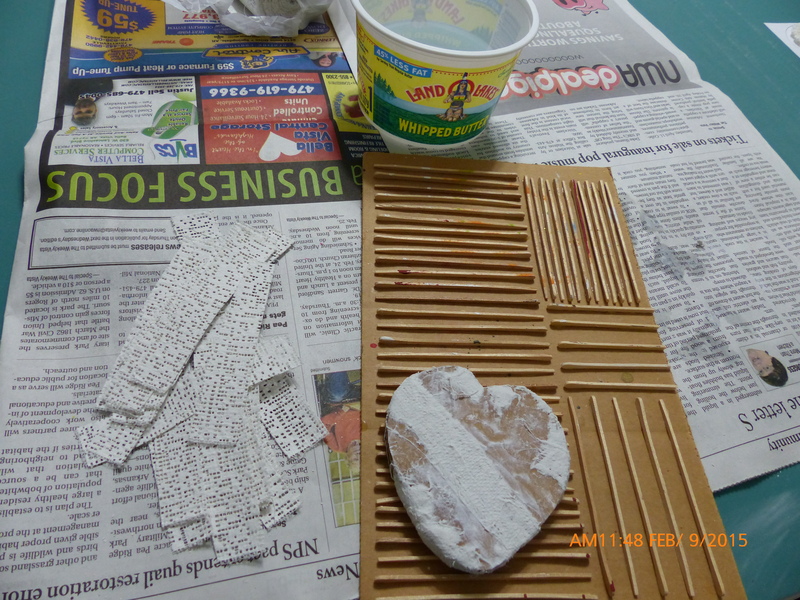 Next cut some strips from a roll of E-Z Form Plaster Cloth Wrap. Be sure to only dip one strip at a time in warm water, run your fingers down the length of the strip and apply to your form. Use your fingers again to rub across the strip to remove the holes and smooth it out. This is a little messy so I only stopped to take one photo. Next time, I’ll do a video. Here I am starting on the second side. Overlap and criss-cross the strips. Again I was not concerned with perfection or smoothness but If you want your form to be smooth, add another layer using wider strips. I only applied one layer here. This was not dry after 1-1/2 hours and the hairdryer wasn’t enough to dry it either, so I dried it in the microwave at 2-minute intervals for 6-minutes. The heart became puffier in the process. I forgot to place a ribbon hanger between the two cardboard shapes so I used 527 glue to insert an I-pin and let it set up overnight. I yanked on it this morning and it held, which kind of surprised me. 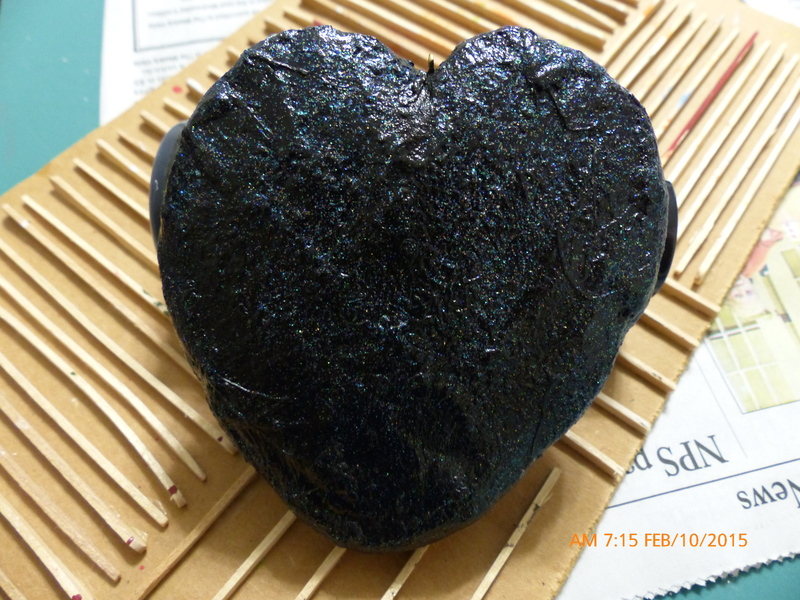 Next, I tried a method of transferring print to the back of the heart. Basically, you apply some Mod-Podge and burnish your torn printed piece, lift up and the text will remain (backwards of course). This did not work for me. Either I did not apply enough Mod-Podge or the surface was not smooth enough. I will try this again in future. 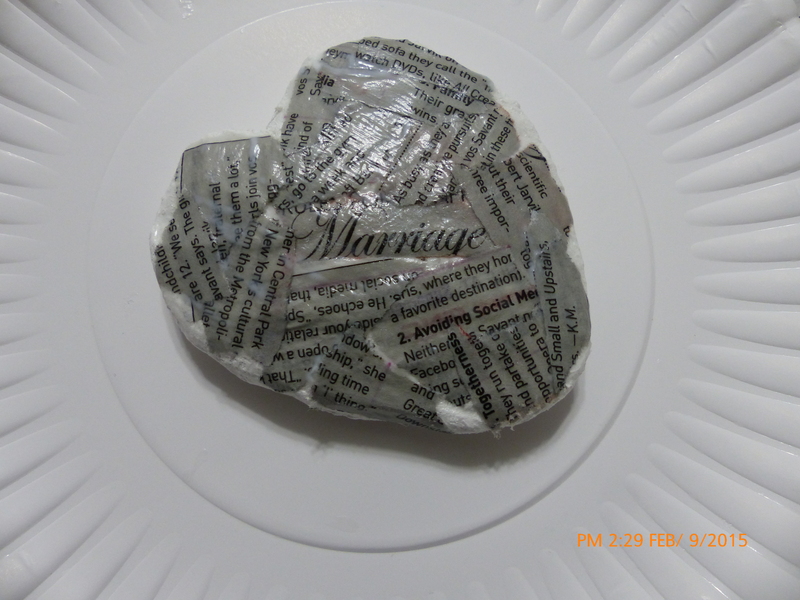 I was using an article from the Parade on marriage and really would have preferred it to be a mirror image but hey, it had a grey background so I just collaged it instead. In the meantime, you can give it a try. Here is the link for Print Transfer Technique: http://birgitkerr.blogspot.com/ Let me know how this works for you. I used Folk Art Metallic Sequin Black to cover the remainder of the heart, sponging around the text to soften the edges. This did not want to dry either so once again, I used the hair dryer and let it set up overnight. I wanted more sparkle, so I overcoated the entire heart with DecoArt Ultra Fine Glitter Paint (Ice Crystal Glamour Dust). This needs to set up for 24 hours. 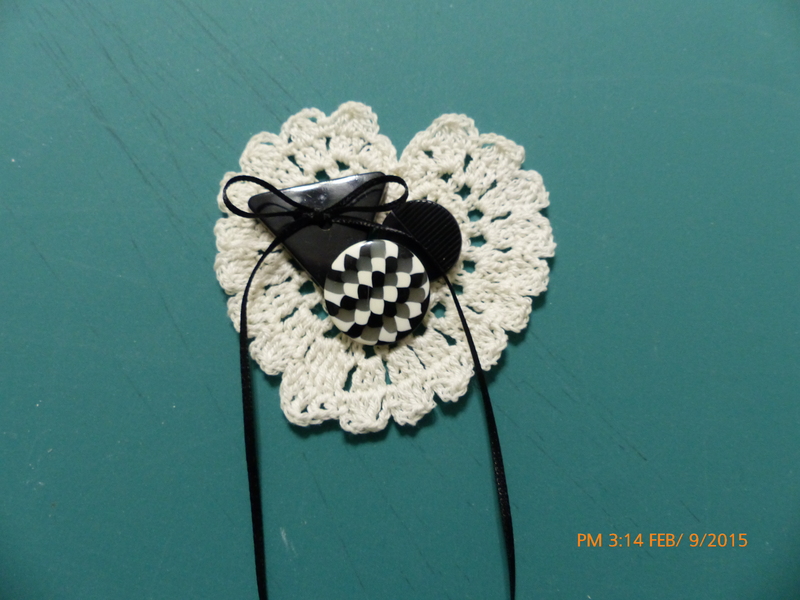 In the meantime, I dug in the old button box and added some ribbon to the crocheted heart. Tomorrow I’ll be back to finish this project, so until then, have a creative day. I’m venturing out of the house today–I need to pick up some pastel paper for a class and run some other errands. The bronchitis finally seems to be letting go–I have coughed for over three weeks and have been isolated for way too long. I’m off (way off).